Over Easter weekend 2015, four roguish thieves in their sixties and seventies came out of retirement. They planned one last career-topping heist that they hoped would land them in the history books. Perhaps not the smoothest of criminals, they nevertheless walked away with a stunning haul—more than $20 million in jewels, gold, diamonds, family heirlooms, and cash. 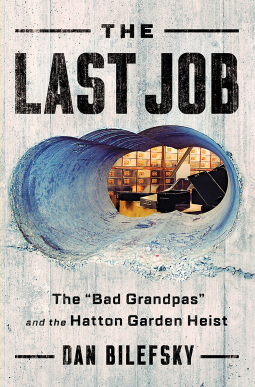 Veteran crime reporter and former London correspondent for the New York Times, Dan Bilefsky offers a gripping account of how these unassuming criminal masterminds nearly pulled off one of the great heists of the century. Drawing on unrivaled access to the leading officers on the case at the Flying Squad, the legendary Scotland Yard unit that hunted the gang, and notorious criminals from London’s shadowy underworld, Bilefsky follows the villains as they plot, execute, and attempt to evade capture in a nail-biting game of cat-and-mouse. About the Author: Dan Bilefsky is a journalist who has reported from cities all around the world, including London, Paris, Brussels, and Istanbul. He is currently a New York Times Canada correspondent based in Montreal. While the topic itself leads to a great story, Bilefsky captured the story with a steady sense of wonder. He didn’t just regurgitate the facts of a globally known news story that happened just years ago. He wove a story that captures the reader and satisfies the need to know all the facts.